Could wearable technology lead to a merging of flesh with silicon? Futurist Ray Kurzweil predicts a “technological singularity” in which artificial intelligence surpasses the capabilities of old-school organic brains. Then as perhaps an upgrade, our silicon begins merging with our bodies. Wearables, in a primitive sense, could represent a baby step toward the singularity. But as I stood outside the gates of CES 2014, holding a limp, shoddily fashioned smartwatch, I felt skeptical. Could smartwatch technology improve my, or anyone’s, life? Two styles of watch dominated the floor show: Notifications watches (like the Pebble, which we reviewed) Pebble Smartwatch Review & Giveaway Pebble Smartwatch Review & Giveaway Smartwatches are the new hottest trend in today's tech world, and the Pebble e-ink watch helped start the fire. The most successful Kickstarter project to date, the Pebble raised over $10 million during its 1-month... Read More and health and fitness-oriented devices. Notifications watches really don’t seem useful as we already get notifications on our phones. Health-related wearables tell you things you already should know. After all, doctors have been telling patients for generations that limiting caloric intake combined with regular cardiovascular exercise greatly improves longevity. Would receiving biometric data somehow beat the advice from medical professionals? Wearables feel like a product of yet another overhyped consumer electronics show. Swallowing my skepticism, I plodded the sprawling Las Vegas convention center, speaking to dozens of representatives. After receiving first-hand demonstrations and interviews, I present six of the more interesting and useful wearable tech devices either on the market, or soon to enter it. What Is Wearable Technology and What Does It Do? Wearables first arose in the 1980s – back when calculator watches were all the rage. However, the modern incarnation didn’t show until CES 2013 – compared to its ancestors, modern wearables both collect and process data. 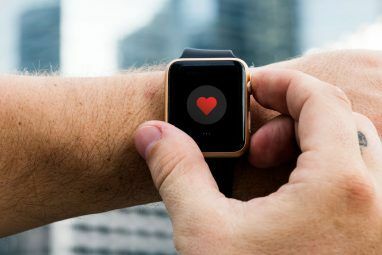 The ground-shaking distinction between older wearables and the latest incarnations is the ability to collect biometric data. Wearable technology provides two primary functions: First, it bi-directionally transfers information from the wearable and your smartphone or tablet. Second, wearable technology converts unused real estate on the human body into something useful. Fused into a single device, smartwatches, smart headbands, and more, allow biometric data to instantaneously sync between the user and the Internet. So far two kinds of devices (notification gadgets and health-oriented products) process two kinds of data: Biological data and smartphone notifications. The fastest growing field, however, remains health-oriented products – and if CES provides a vision of things to come, the space occupied by our physical bodies will merge with the realm of the technological. I received a first-hand look at a variety of wearable technologies. Compared to what we saw at CES 2013, I saw modest improvements in energy consumption and performance. Most of the new smartwatches and similar devices use custom designed circuits (known as ASIC) using ARM chips What Is an ARM Processor? Everything You Need to Know What Is an ARM Processor? Everything You Need to Know If you’ve paid any attention to smartphones and tablets you’ve likely heard of the term "ARM" used to refer to the hardware inside. It’s thrown around left and right, often as a point of differentiation... Read More . Together, these allow for extremely low energy consumption and minuscule size. They also added Bluetooth 4.0, which allows for longer battery life for both your wearable and your smartphone or tablet. Unlike the other wearable tech, InteraXon’s Muse is a circlet, worn about the head. It employs seven sensors (the prototype used four), which monitor users’ brain activity, specifically EEG (electroencephalography). EEG readings are the electrical activity that shows up along the scalp (and isn’t technically direct brain activity). I received assurances by co-founder, and product manager, Trevor Coleman, that Muse can distinguish between background electromagnetic radiation and the electrical activity produced by the human body. The science of EEG readings are extremely well documented, so, for the skeptics, we know that the underlying technology is based on science. You may recall from a myriad number of soap operas that EEG sensors read whether a comatose patient is either brain dead or simply unconscious. My impression of the Muse is quite high. While the concept sounds vaguely wonky, it possesses a degree of theoretical backing: A recent study done on mindfulness meditation, specifically the Integrative Body-Mind Training technique, can actually cause physical changes in brain matter. The theory behind it is quite simple: If you train yourself to respond calmly to anxiety inducing scenarios you can retain higher level cognitive functions. Taking an exam or showing up for an interview, with such training, might not cause such stress. So in theory the Muse may actually work. Rating: Hot! The emergent field of neuro-feedback falls on the cutting edge of device development. No one else is developing anything remotely close to the Muse headband. The Fitbit Force offers an incremental upgrade over the previous Fitbit Flex. It includes 7-10 days of battery life, Bluetooth Low Energy (Bluetooth 4.0) and membership at Fitbit.com, which allows its user to check logs of their daily activities. These include food and water intake, body mass and other metrics that fitness geeks would want to know. From what I could tell, the device looked well-constructed and offered the vanilla wearable tech experience: Biometrics, notifications and time. Despite its limited sensor suite, the Force offers excellent value, combining a lower price-point with smartphone syncing and some degree of biometric data on its user. Sensory apparatus: Accelerometer (3-axis) and altimeter. The Force’s predecessor, the Fitbit Flex (which we compared against the Jawbone Fitbit Flex vs. Jawbone UP: A Comparative Review Fitbit Flex vs. Jawbone UP: A Comparative Review In today's world, nothing escapes the fact that we are moving in a direction where quantifying and recording stuff obsessively is sort of the norm. We use Foursquare to check into places, we annoyingly take... Read More ), was one of the most popular health-oriented wearables of last year. It received fairly good reviews and its successor seems to receive about the same attention – that is, unless you have a skin allergy to nickel, in which case you may need to look elsewhere (update: The Force was just recalled after a rash of complaints). Rating: Hot. The Fitbit Force remains at the top of the ruggedized wearable tech. You can take it virtually anywhere. On the downside, it doesn’t offer the sophistication of other devices and its functionality remains identical to several other wearables. The Basis Carbon Steel edition Health Tracker impressed me the most, at CES. It didn’t have the longest battery endurance, or latest specifications. Nor did it come with the lowest price. Instead, it offered the widest sensor suite, and an open development API for Android and iOS (although I couldn’t find any available apps). To my knowledge, the Basis Health Tracker provides the deepest biometric information on its users out of all the smartwatches and wearable tech on the market — it falls somewhere between a medical device and a consumer product. However, Basis makes it clear that it is not a medical device and shouldn’t be used as such (likely for legal reasons). Hilariously, the Director of Product demoing the Basis Tracker, Tejash Unadkat, held an impressive 58 beats per minute heart rate, while giving a live demo. Given the anxiety of social interaction combined with the having a video camera trained on him, Tejash’s heart rate is quite impressive. In the past, my heart rate hovered around 90 – in social situations it elevated substantially more (Tejash suggested I needed to work out more). But overall, it’s an impressive technology. 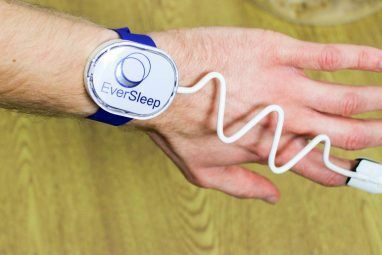 Sensory apparatus: Seven sensor suite, covering activity, sleep quality, caloric burn and more. My battery cut out as I was filming, but as you can see, the Basis possesses a great deal of potential. 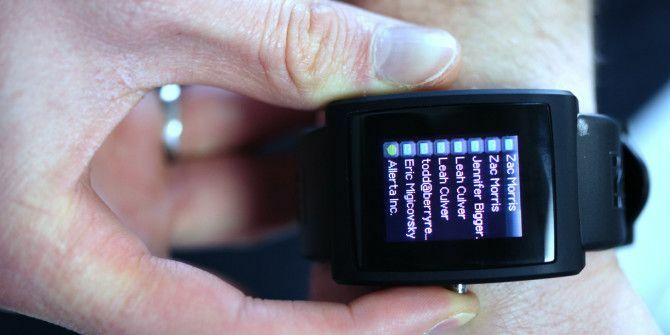 It already offers the most comprehensive sensor suite out of all the smartwatches and it stands to add additional features through its open development API (according to Tejash). The entire watch also slides in and out of a USB charging cradle and many of its components are modularized for ease of replacement. Its service also includes gamification of fitness activities. We’ve written before about how gamification’s point-based approach can improve your life Points For Everything: How I Tried to Win At Life With Gamification Points For Everything: How I Tried to Win At Life With Gamification My brain is stupid. It thinks I can get done tomorrow what I need to do today, and that I can do this afternoon what I need to do this morning. It puts everything off.... Read More . Overall, the Basis Health Tracker Titanium Edition offers outstanding health metrics at the expense of battery life. The three or four-day battery life falls a great deal shorter than the two-years offered by Casio. Rating: Hot! While the Basis Health Tracker falls short of perfect, its sophisticated sensor suite can provide unique insights into its user’s daily activities. The Casio STB-1000 smartwatch offers a remarkable 2-year battery life. This places it at the top of the devices in recharge cycles – it also offers vibration alerts, smartphone pairing, ruggedization and bidirectional control between a paired smartphone and the watch. Essentially, you can use the watch to operate your smartphone and vice-versa. Rating: Warm. 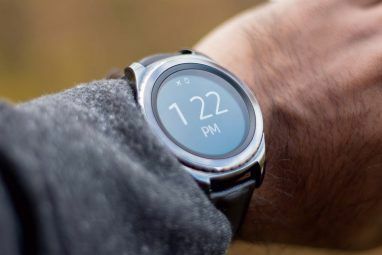 While the STB-1000 remains by far the most rugged and durable of the smartwatches, notification wearables fall short of impressive. Price: $269 until launch; $349 after launch. While the Qualcomm Toq didn’t debut at CES, I thought it necessary to include it in this roundup of wearable tech. Instead of providing metrics on health, it gives notifications, weather predictions and more. It’s unique in that it uses a highly advanced e-paper technology known as Mirasol. Mirasol offers similar battery efficiency as E Ink products, with the exception that it can operate in the same way as an LCD screen: Full color and video graphics. Thanks to the low-powered screen, the Toq has more than a week of battery life (according to reports). Had Qualcomm paired their technology with Bluetooth 4.0 and better internal components, it would have offered substantially better endurance. As it stands, Qualcomm’s Toq doesn’t particularly stand out from its competitors, except in pricing – it costs $349, making it the most expensive device in its category. Holding it in my hand, it felt exactly like a miniature smartphone. Unfortunately, the Toq primarily provides notifications and a degree of control for your smartphone. While water-proof and semi-rugged, it fails to stand out in any serious way from its competition. On the other hand, it represents a wildly different, and technologically sophisticated device. Hopefully, the next iteration of the Toq will include Bluetooth 4.0, a richer sensor suite and wireless Qi charging, instead of its own (along with Samsung) wireless charging solution. Rating: Warm. The high cost and lack of focus don’t allow the Toq to stand out from its competitors. While technologically sophisticated, it fails to crush similar notification gadgets. The Metria smartpatch provides similar functionality to smartwatches, with a subtle, but important distinction: It’s disposable after a week. Its short-lifespan is by design. The smartpatch offers a low-cost method to aid doctors in the identification of potential health risks. We assume that most users would only need to wear one for a short period of time, so its short longevity shouldn’t cause much concern. Looking at the device, it certainly gave off the impression of greater comfort than a smartwatch. The product manager mentioned that the adhesive is actually quite powerful and the device doesn’t stand a chance of slipping off. Of course, as a medical device you definitely wouldn’t want that happening. Considering that it offered slightly fewer sensors than the Basis Health Tracker, it offers less value to those looking to identify health problems over the long term. Rating: Warm. While it’s potentially a revolutionary technology for the medical industry, the Metria Smartpatch isn’t something you’d just buy for the heck of it. In my opinion, the notification watches don’t really offer much value to consumers. What can a notifications watch do that a smartphone doesn’t already provide? Some users might take advantage of their stealthy, low-profiles to text friends while in class or at meetings — but unless you enjoy slacking off, they’re superfluous and expensive. Conversely, health oriented smart devices can eventually replace expensive medical diagnostic equipment. Right now, they offer insight into your habits but in the near-distant future they could provide a great deal more benefit. Perhaps the singularity is approaching? If devices such as the Muse signal the future, our brains seem poised to become upgraded, so to speak, by our machines. As technological sophistication increases at an ever accelerating pace, the lines between our bodies and machines may blur. The potential of a technological singularity weighed on me. But before leaving the convention, I received a perverse reminder that flesh and metal might remains separate for some time. As I returned to my hotel room, and fished through a clutch of business cards, I noticed something unusual: Someone had slipped a room card key, accompanied a room number jotted down on a piece of paper. Had someone tried to lure me to their hotel room? I had received dozens of cards that day and spoken with twice as many reps – the card provided a sad reminder that no matter how integrated we become with our machines, we still possess reckless physical desires. A fairly banal feature you may not have thought of is whether the watch band is replaceable or not. I've had to toss two otherwise functional digital watches because I couldn't get replacement bands (thanks Casio and Timex). Finally I got a titanium banded Casio which is just big and ugly enough to be repairable. I totally forgot to mention that! Thanks for the comment Godel. To the best of my knowledge, some of the health-oriented wearables have replaceable bands. The Basis Carbon Steel Editon uses a modular design and offers band replacements. I remember something about there being band upgrades, but I'm not entirely certain. The older Fitbit Flex offers some kind of replacement band, but it's not as simple to replace as the Basis Health Tracker. I don't think the Fitbit Force offers a replaceable band, or otherwise they wouldn't have had to recall their entire product line over the skin rash issue. And I also think the STB-1000 has a replaceable band that screws out of the watch housing. I would have thought he point of notification devices would be more to prevent procrastination rather than to enable it. If I get a notification on my watch I can glance at it, know what it says and then continue with my work; if I get a notification on my phone I have to get it out of my pocket, unlock it, open notifications, notice something else that I need to do, go into that, get distracted by something else, tell the folks on Facebook about that something else, read a few of their updates, get distracted by one of them, read a news article, realise it is lunch time, go out to the cafe. If I had notifications on my watch then I would have slacked off so much less. That's an interesting comment. You're right. I think a more disciplined person would indeed benefit from a notifications watch. I have most of my phone's notifications turned off and I only check it periodically. You say "a sad reminder that no matter how integrated we become with our machines, we still possess reckless physical desires." I say "a liberating reminder that no matter how much technology infiltrates our lives, we still need human connections and crave the excitement of reckless adventures." :-) Dann, it's amazing that two people can see the same work of art - one perceives beauty while the other sees ugliness. The one who sees beauty gains something positive. The other got to see something ugly and his day is ruined. I am perhaps viewing the world through the wrong lens? Thanks for the comment! LOL, I had a calculator watch. I thought it was the coolest thing ever! I do remember a watch that was supplied with a plug-in, mini keyboard which allowed you to use it as a personal organiser type thing - that was in the mid eighties! Casio have had Bluetooth LE watches available for some time now, those would qualify as smart-devices, I think. Spendy, but neat. I disagree with your conclusion... you didn't review the samsung gear in this article which I purchased about 2 months ago. I've found the conveince of being able to take a picture with it without having to dig my phone out of my pocket and go to camera mode has got a lot of photos I would have missed otherwise, and if I get a text or call while I'm in a meeting it's a discreet glance at my watch not digging my phone out of my pocket to check it. The effort this watch has saved me in just not having to dig out my phone has been worth every penny. I completely agree. It seems you're projecting your personal dislike for notifications on "consumers". Notifications are incredibly convenient to me with my pebble since I, like most people, don't have my phone out sitting face-up all day. That's a good point. I may be projecting my own prejudices onto notifications watches. I still feel that they don't offer the sort of value that I'd expect from a modern wearable. Ideally, a wearable should offer notifications as a secondary function, rather than as a primary. After all, they all sync with tablets and smartphones already, so it would be easy to include support for both notifications and health - health oriented notifications? Withings BPM Core: Smart Heart Health Management?